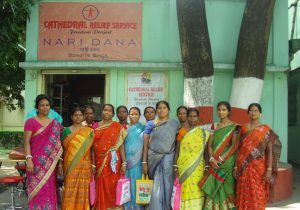 Nari Dana, which means “women’s wings”, is an exciting new social enterprise that has been established in Kolkata with the support of the UK Friends of CRS. CRS’s women’s empowerment programme provides skills training for women and girls in the slums. Nari Dana takes the emancipation of women a stage further by providing a business to develop and sell products made by the women to enable them to earn a decent and secure living. Ritu Ghosh is the Quality and Production Manager of the new business, and has been working for over a year with an initial cohort of about 30 women, developing high quality products to be sold both locally and on overseas western markets, primarily in the UK. A production centre has been established next to the CRS office, and a number of Juki industrial sewing machines have been bought and are housed there. A limited company (Nari Dana Home Accessories Private Ltd) has been incorporated in Kolkata, and will be the vehicle through which the new business will be run. It will employ the women and market the products. The project was inspired by teaming up with Veronica, a former product manager from the UK textile industry, who has started a web-based business called Tabitha Living to sell Freedom Products, including items which she has designed to be made by women from the CRS slums. Veronica has been working closely with Ritu to develop a range of good quality sewn and hand-embroidered household products. Ritu has also developed a range of products which are being made by the women and sold on the local market. It is hoped that, in time, Nari Dana will be recognised as a distinctive brand of quality goods. A website has been established for Nari Dana and, in due course, it is intended to sell online to the local market. In November 2014, Veronica joined two of the UK Friends of CRS trustees on a trip to Kolkata. About 140 women from the slums came to meet her, all of whom were eager to take part in the project. Nari Dana was then born, and we believe that it will provide a large step beyond the existing self-help groups, and provide a regular and sustained income for women trapped by poverty, prostitution and other social ills. In Ritu’s words: “Nari Dana believes that women are the largest untapped source of talent in the world”.